Would you be extraordinarily excited if you opened up a package from Santa this year and it was a coupon good for one session of teeth whitening? We thought so! If your answer is “yes” but you totally forgot to ask St. Nick for cosmetic care this year, you’re not out of luck! Our Auburn Hills, MI team can most certainly ensure that you can end up with the gift of a whiter, beautiful smile. Not sure what to do at this point but you would sure love to walk into 2019 with plans for a grin that shines nice and bright? Consider some simple suggestions from our team! One of the easiest ways to be certain you’re going to end up with a whiter smile, thanks to the teeth whitening you really want, is to give yourself the present of whitening. That’s right. Call us up, tell us that you’re ready, and decide when will work best for you. 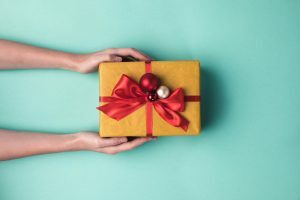 If you feel like you’re the only one giving yourself presents, we remind you: It’s a very common practice and is a nice way to give yourself a bit of “me time,” the benefits of which will boost your confidence and last for many years! Maybe your spouse is the one who is hoping for teeth whitening and you just happen to know it. Give this cosmetic treatment as a present and watch as your loved one’s face lights up just as nearly as bright as his or her smile is going to become. Perhaps you call us and schedule the visit on behalf of your spouse or maybe you choose to come in together for a couple’s gift. Whatever the case, it’s a very thoughtful gesture! Good news: If you wanted to give yourself teeth whitening as a Christmas gift but the reason you didn’t mention this to anyone (or give it to yourself) is because you already know you’re not a good candidate for this treatment, that’s no reason to give up! Remember: Our team offers porcelain veneers, too. Come in soon to learn about your options and then, gift a treatment to yourself! Whiten Your Grin As A Holiday Gift! Give yourself or your loved one the gift of a glowing smile when you visit us for teeth whitening or other cosmetic care! To learn more, schedule an appointment or initial consultation by calling Advanced Dental Concepts in Auburn Hills, MI today at (248) 852-1820.